Why was the Toyota Production System (from which Lean evolved) so affected by Confucianism in particular? One reason is that the area where Toyota is from is the absolute core area of Confucianism in Japan. The Toyota headquarters is located a bit over 100 km from the Azuchi Castle, which is one of the most well-known 16th century strongholds of Confucianism in Japan. It is also located right in the middle of the string of the main Confucian temples in Japan that stretch from Taku on Kyushu to Tokyo on Honshu. Furthermore, during the Tokugawa period (1603-1868), the area around the Toyota headquarters was directly controlled by the central government, who strongly espoused their own views on Confucianism. This only establishes that Confucianism was present at the birthplace of Lean, not that it actually had any effect. To establish that point, we need to turn directly to material from one of the original creators of the Toyota Production System, Taiichi Ohno. In Taiichi Ohno’s Workplace Management, Ohno recollects studying the Analects of Confucius while in school, and quotes from the Analects multiple times, including right at the very beginning of the book, where he discusses at length how Confucius instructs the wise to quickly mend their ways, to admit when they are wrong (and even the wise are wrong many times) and to revise orders immediately when they are found to be ineffective. This must be understood in a proper context. I do not claim that Taiichi Ohno knowingly built Lean on Confucianism, or even that he spent time thinking about their relationship. Ohno was not a philosopher, but more of a practitioner. However, I do claim that Ohno’s way of life was to a large extent based on Confucianism and that Lean as he built it was based on the same principles he lived his life by. Furthermore, because it was built in a region with deep roots in Confucianism, these principles were easy for other people there to adopt as well. 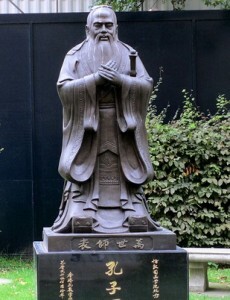 By understanding its relationship with Confucianism, it is easier to understand Lean, and by making the connection explicit, it can even be possible to articulate Lean in a clearer way. To quote Wikipedia on Confucianism, its core is “the belief that human beings are teachable, improvable and perfectible through personal and communal endeavor especially including self-cultivation and self-creation.” This striving for perfection is at the very core of Lean. Self-learning and self-improvement have a prominent place in Lean, to the point that it is fundamentally impossible for management to improve operations, they can only challenge and help the shop floor employees to improve them. This is also the core of respect for people in Lean. According to Confucianism, the whole world is ultimately good and possible to perfect. Lean is the logical result of this thinking when applied to work. Like Confucianism, Lean is also fundamentally meritocratic. Everyone in the organization is given all the opportunities to develop themselves and their environment, and those who grasp these opportunities the best are the ones who advance. This close relationship between Confucian ideals and Lean raises the question how easy it is to apply Lean in the West, where the cultural heritage is different. However, the Confucian strive for perfection is no stranger to Western culture either. In fact, ideals of this sort are rather common in many of the great works of philosophy, including those of Kant and Locke, and extending to the 19th century, for example in the works of John Stuart Mill. When it comes to constant improvement towards perfection, this ideal is actually behind some core Western values. The modern democratic system is largely built on the arguments first presented by John Stuart Mill, especially in his On Liberty, and Mill was a proponent of ever-improving mankind. Freedom of speech was one of the most important aspects of securing that improvement even in cases where the opinions stated were false, as even that dialogue served to reinforce the truths and (more commonly) find weaknesses in the prevailing opinions that enabled further improvement. This might not be obvious today, but the rationale behind freedom of speech is not that all opinions are as correct and as valuable, but that silencing any opinion would impede improvement towards perfection. Alas, the 20th century and 21st century have witnessed significant changes in the Western value systems. The rise of pluralism and relativism have made perfection a word that many people associate with negative meanings. How can anyone strive for perfection, if everything is equally valuable? Applied to work, this is a recipe for a disaster: if nothing can be expected from anyone, how can a company remain competitive? If I only come to work to give the employer the hours of my time he has paid for, and have my “life” start at 4 pm outside work each day, why would perfection at work have any significance for me? This is the fundamental problem when it comes to applying Lean in the West. Many people do not care about perfection. They do not care about the perfection of themselves, nor do they care about the perfection of their work. The whole concept of Lean is based on the idea that people want to perfect themselves and Lean makes the workplace a place where that is possible, so when people simply do not have this motivation, the whole structure crumbles. I hope to have demonstrated in this post that Lean is built on Confucianism, at least implicitly, if not explicitly, and that understanding this basis of Lean helps understand Lean itself. This foundation also serves to explain why Lean is so difficult to understand and adopt in the West. The adoption problem is truly fundamental, because the individual desire to strive for perfection is so fundamental to Lean. The history of the Western value systems is mostly compatible with Lean, but important elements have fallen out of favor lately. There are many examples where people have been successfully motivated to pursue Lean ways and take pride in their work, but having to motivate people to do things the creators of Lean presumed everyone is naturally motivated to do is an additional complication to the adoption of Lean in the West. Next Next post: Why LEGO Universe failed and can Minifigures Online succeed?